Mall of Split, a leading shopping center in Croatia, has added new brands and concepts to expand its offer and provide a unique, urban-lifestyle experience. 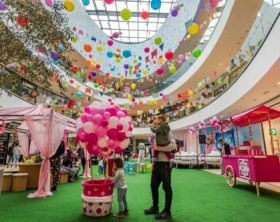 Mall of Split in Croatia has this month celebrated its third anniversary with a range of events, offers and surprises for visitors. OTP bank, the fourth largest bank in Croatia, opened its new branch on the ground floor of Mall of Split on the 14th of January. TEDI, a German retailer of household goods and accessories, opened its new store in Croatia, located within Mall of Split, on the 31st of October. Mejaši Prvi is the investor of Mall of Split shopping center, located on Josipa Jovića 93 Split, Croatia. Pandora, one of the world’s leading jewelry brands, opened its new store within Mall of Split, located at no. 93 Josipa Jovića Street, on the 26th of September. CineStar 4DX™ Mall of Split, the biggest ultramodern multiplex in the Croatian region of Dalmatia, received on the 10th of June the "Best New Build Cinema of the Year" award at the ICTA (The International Cinema Technology Association) ceremony in Barcelona. MALL OF SPLIT located at Jospia Jovića no. 93 Street in Split, opened two new stores on the 1st of June, GUESS and THE ATHLETE’S FOOT . Shoebox Adria d.o.o, the company operating the international footwear chain Office Shoes in Croatia, opened on the 26th of April its relocated store within Mall of Split at Josipa Jovića no. 93 Street. Mall of Split located at Jospia Jovića no. 93 Street in Split, opened two new stores this April, BIO PLANET and LINEA INTIMA . Extreme Intimo, Serbian lingerie and underwear brand, opened on the 12th of April its new store within Mall of Split at Jospia Jovića no. 93 Street, Croatia. Studio Elgo, Croatian retailer of kitchen and home electronics, opened on the 22nd of March a new store within the Mall of Split. VBZ, Croatian publishing house and bookstore, opened on the 27th of January a new store within the Mall of Split in Croatia. Receive weekly retail market news.